The widespread rural areas of Idaho make it an ideal state for pursuing a college education online. Recent reports show up to 20 percent of residents live at least an hour’s drive from a college campus, and growing distance learning programs in the state providing opportunities for those without close proximity to a college or university to easily earn a college degree. If you’ve never considered the possibility of attending college, or are interested in finding more information but aren’t sure where to start, this page provides answers to common questions about online colleges and universities in Idaho and advice on how to pay for school, take advantage of transfer credit opportunities and more. Brigham Young University-Idaho offers certificate, associate and bachelor's degrees online, along with a stackable degree plan, allowing students to earn all three of these in a 4-year time frame. Interested students can work with advisers upon admission to create a cohesive, stackable degree plan in which each program's learning builds upon the next to expedite degree achievement. For those planning to pursue just the bachelor's degree, 120 credits are required by graduation. Online courses stick to the campus semester format and flow like on-campus classes, with assignments observing specific deadlines. Students will also participate in online discussion boards and receive academic support from teachers, the Academic Student Support Centers and online tutoring service. The University of Idaho currently offers several online bachelor's degree programs, ranging from the general and traditional - such as psychology and history - to more specialized - such as organizational sciences with concentrations in either organizations and communities or organizational communication, or sociology with an emphasis on criminology. These are considered 4-year programs, with the exception of the 2 + 2 sociology and psychology programs. Transfer students can shorten program lengths by transferring in credits or associate degrees from accredited colleges. Articulation agreements, in place with several Idaho community colleges, can help make a smooth transition to one of U of I's bachelor's degree programs. Bachelor's degrees at Boise State Online are career-oriented, such as those in the medical field, while also a good fit for transfer and adult students. The Applied Science degree is designed to build onto an AAS degree, and the multi-disciplinary program works well for those with previous college credits looking for an accelerated bachelor's degree. In addition, these degrees can be used as stepping stones to graduate school. Along with flexibility, qualifying online students can expect to pay a flat, per-credit rate on tuition and don't have to worry about paying out-of-state tuition. Another attractive feature of attending Boise Online is regional accreditation, along with several individually accredited 4-year programs to choose from, such as nursing, business, respiratory care and allied health. Northwest Nazarene University has a well-rounded choice of online degrees at both the undergraduate and graduate level, geared toward working professionals, transfer students, those planning to attend graduate school and first-time students. its 4-year degree programs include liberal studies, Christian ministry, business and nursing. Programs are 100% online, but differ greatly in course structure, prerequisites, admission requirements and program length. The RN-to-BSN degree takes 5 semesters to complete, with admission requirements specific to nursing students; the BA in business administration is an accelerated, 16-month program in cohort format; the BA in Christian ministry takes 36 months; and the BA in liberal studies offers part-time or full-time enrollment. Tuition rates vary slightly between programs but is not residency dependent. Online programs at Idaho State University (ISU) offer lots of flexibility through its various delivery options, which include synchronous, asynchronous or a combination of the two. Courses may be web-enhanced or use web conferencing or they may be mostly online with up to 5 required campus visits or 100% online. Zoom, Moodle and Blackboard Collaborate are used to deliver real-time lectures and demonstrations. Programs are considered fully online but may have in-person graduation requirements such as internships and practicums, like those offered through the ISU-Meridian Health Sciences Center. Other 4-year programs include psychology, workplace training and leadership, emergency management, emergency medical services and fire services administration. All online students can work with online advisers and benefit from in-state tuition regardless of residency. How can I find which online colleges offer the degree I'm looking for in Idaho? Every major college and university in Idaho—including big public universities like the University of Idaho, Boise State University, and Idaho State University—offers online education in a variety of fields for bachelor's, master's and post-doctoral programs. To find which offer the programs and majors that interest you, start on the web. Each college should provide a comprehensive list of their online programs, like Degree Finder at the University of Idaho. A list of all colleges registered in the state of Idaho can be found on the Idaho State Board of Education website. To search for all accredited colleges and universities in the state, click the search button to the right. Which online schools in Idaho will accept my transfer credits or work/life experience? Understanding different college transfer credit policies can be complicated, which is why the State of Idaho provides the Course Transfer program. 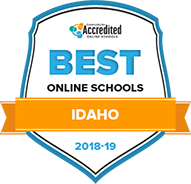 Whether you're transferring credits from another institution or anticipate having to do so in the future, this portal can help you navigate the process in Idaho. Most schools will accept transfer credits from other regionally accredited colleges and universities around the country. Some Idaho colleges will also offer to apply college credits for your life skills and work experience, as evaluated through the College Level Examination Program (CLEP). There are a number of other potential credit-for-experience opportunities at Idaho colleges, including credit for military service, credit for adult education and extended learning, study abroad experiences and high school honors classes. Check with the Admissions Office at your prospective school for details. How Much More Do College Grads in Idaho Make? Fact or fiction: do college grads earn higher salaries? In the state of Idaho, yes. Based on numbers from the U.S. Bureau of Labor Statistics, jobs that require higher education pay, on average, more than jobs that do not, meaning earning an online degree from a school in Idaho is an investment in your future that also has the potential to really pay off. Let’s take a closer look at the numbers. The BLS also shows many occupations in Idaho require graduate-level education—the state ranks sixth-highest in the nation when it comes to the percentage of careers that require a master’s degree. And Idaho is one of the fastest-growing states in the nation, due in part to a boom in the technology sector. For students interested in earning their college degree online, tech careers are highly popular and well-paying. Other fast-growing industries in the state include utilities, educational services and healthcare and social assistance. The NWCCU is the accrediting body measuring educational effectiveness and quality for Idaho colleges, and is one of seven accreditors recognized by the U.S. Department of Education. Member schools from six other states—Alaska, Montana, Nevada, Oregon, Utah and Washington—are regulated by the NWCCU. These optional, additional accreditations vary by school, and focus on a specialized department of study. For example, the University of Idaho carries more than 20 additional, specialized accreditations on top of their regional accreditation from the NWCCU. These specialized accreditations ensure educators are keeping on par with industry-specific standards. These figures do not account for students who are not Idaho residents. As with the fees mentioned above, be sure to understand the full cost associated with attending an online program in Idaho if you are from another states. What are Idaho's requirements to qualify for in-state university tuition? The Idaho Residency Determination Worksheet is a helpful resource for prospective students trying to determine if they qualify for in-state tuition. If you don't meet these requirements, some institutions offer programs to help offset tuition costs for non-residents. Several universities in Idaho give tuition reductions to students from the 14 states participating in the Western Undergraduate Exchange: Alaska, Arizona, California, Colorado, Hawaii, Montana, Nevada, New Mexico, North Dakota, Oregon, South Dakota, Utah, Washington and Wyoming. Are online credits more affordable in Idaho than other places? How can I get help paying for online college in Idaho? Beyond national scholarships and federal financial aid (FAFSA), there are many scholarships and financial aid opportunities reserved exclusively for Idaho students. Idaho State University, for example, offers generous funding, gifting approximately $10 million in scholarships and grants each year. The Idaho State Board of Education also offers a scholarship specifically for adult learners, awarding eligible applicants up to $3,500 per year. Check with your school’s financial aid office for more details on state- and institution-specific scholarship options. For many people, deciding to go back to college as an adult is more difficult than simply sending in an application. Those who have been away from the classroom for a number of years may feel unprepared for the rigors of academic life, but there are programs designed to help adult learners make the transition from family or workplace commitments back into college. Adult Basic Education – For students needing a refresher course in basic reading, writing and math skills, look for local basic education courses. English language courses and college readiness classes are also generally provided. High School Diploma – Prepare to take the GED test through these high school equivalency programs provided through adult education. Transferring Credits to College – The Next Steps Idaho program prepares students to navigate the college transfer process. Professional Development – After college graduation, adult education programs can also help students develop stronger professional and technical skills and certifications.